KISS bassist Gene Simmons is famous for spitting fake blood during live shows. Now he can simply use ketchup - the band's own Hotter Than Hell ketchup. 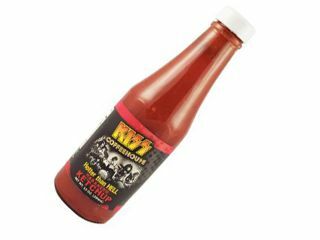 To mark the second anniversary of the KISS Coffeehouse in Myrtle Beach, South Carolina, KISS have announced the addition of Hotter Than Hell ketchup to its product line. Each bottle retails for $7.95. The Kiss Coffeehouse opened in the summer of 2006 and features signature KISS coffees, including Kiss Army Blend and French Kiss Vanilla, the Kiss Frozen Rockuccino, cookies, brownies and other sinful sweets. Here at MusicRadar, we drink plenty of coffee, and when we think java, we naturally think KISS. Well, not really, but if the band want to send us a batch, we'd be more than happy to give it a try. Ketchup too - bring it on. And hey, throw in some of those cookies and brownies - we're not proud.